Finally, smart phones Samsung Behold II is ready for the market, but currently for the U.S. market. Perhaps in the near future, Samsung Behold II who carried this Android OS will start to be launched into the market outside the United States. As one of the famous brands from South Korea, Samsung, spelled out never stopped developing the technology for the output products. As he did on the latest phones Samsung Behold II. 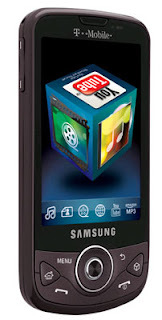 Besutan latest Samsung phone that carries Android-based operating system is already rumored since last July. But in the near future, Samsung Behold II reportedly finally ready to be marketed. Telecommunications company T-Mobile is known to be the first manufacturer to market the Samsung Behold II for the United States market. Maybe after that, then Samsung Behold II will be launched to the market outside the United States. But for Indonesia itself, until now there has been no telecommunications company announced it would become the first manufacturer Samsung Behold II. Samsung Behold II in addition to carrying the Android-based operating system, this smart phone also offers 3.2-inch LCD screen AMOLED. And supported with interesting features, such as 5MP camera equipped with autofocus, flash and video recording. Plus also with visual voicemail, music player, Bluetooth 2.1, WiFi, GPS, 3G and also has been equipped with a microSD external memory for 16GB. Display Samsung Behold II also looks very interesting, by offering a menu display of 3D cube that can turn the menu. Also provided the menu features web browsing and YouTube access that can be selected directly on the menu with ease. So far there has been no explanation of the price that would dibandrol for Samsung Behold II. However, if notice of the interesting features wrapped with Android-based operating system, Samsung Behold II will enter the row of high-end phones.